This popped up on the ole radar this week and I thought I would share. If you know the intricate inner workings of my mind (poor, poor you…), you will know that I have an amazing soft spot for weather and, by proxy, weather apps. Well, a new one dropped this week called WTHR and it’s design is just too good not to share with you all. What I love the best? The screenshot above pretty much tells you everything that the app does! 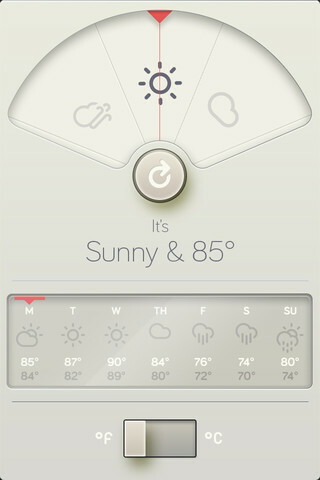 It gives you the weather of where you are at in a simple, clean and beautiful way. No radars, not barometers, no ten day forecasts… just the vitals. Love the style. Love the delivery. Love the app. One important note: It does have some issues with its first release. It leaves the GPS search running even AFTER you’ve closed the app. Pretty big bug, as that can lay waste to your battery life, but I am more than confident that they will fix that in the next release (a lot of weather apps have delivered with this bug). So, wait for the next release or snag it now for 99 cents (?! - link above). If you love good app design and aesthetic, this a bit of a no brainer. Settings>General>Reset (bottom of the list) >Reset Location Warnings. If you are just buying it now, you don’t have to reset a thing. Just use it an enjoy! It’s a shame this bug slipped through the testing process. Oh well, it works great now!